I have mixed feelings whenever Gloomy Gus Chris Hodapp writes “another building lost” post – which, to be fair, almost seems to be every other month. 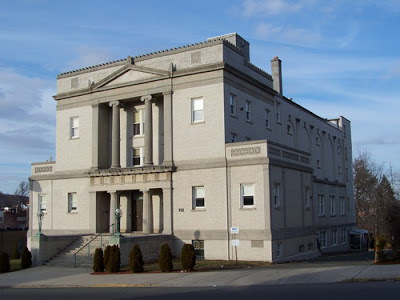 On one hand, it’s always sad to see a nice older Masonic Temples — or any well designed and decorated building, for that matter — falling into disrepair because the upkeep is too expensive for the membership. The period from the early to mid 1900s that saw so many fine temples erected didn’t have the expensive issues of heating and air conditioning costs, specialized maintenance, accessibility upgrades, or power needs that we now think of as essential, and even just maintaining those buildings, let alone improving them, is a huge drain on the resources of the members. On the other hand, how much of a drain on our membership does it take before we all will figure out a new model? The late 1800s to early 1900s saw a different model: have a large building in which several different lodges could meet on different nights, so it wouldn’t sit unused. All the different lodges would pay a little rent to the building association (and this raises the question if Masons “invented” the co-op), and the steady influx of members would assure that the capital reserve funds would be adequate to repair the boiler or to shovel more ice onto the roof, whitewash the picket fence, or do whatever the heck was normal repairs back in those days. And I’m sure that many of the brothers at the time were proud to belong to a lodge that emulated – to some degree – the Temple of King Solomon. Many of the older buildings were richly appointed, and had massive columns, arches, and other fine details.So, yes, it’s disappointing to see those old temples fading, or being sold off so that they can be turned into office condos or meeting centers. As the membership declined, there was simply no way to keep them forever. But on another level, maybe we need to ask ourselves: is a lodge the building or the members? Back in the 1700s to 1800s, when many lodges were essentially a few dozen guys meeting in a pub, they probably didn’t worry about that kind of thing; if the pub closed, they found another one. Having a building was a bit extravagant for guys who might only meet once a week, and certainly ridiculous for a group that would only meet once a month. Some found a home, literally, in the older home donated or sold off from a member’s estate. New England is full of lodges that meet in these small buildings, and almost every other town seemed to have one during the boom years. But even that becomes expensive as turn or the century houses need to be upgraded with better electric and plumbing service, new stairs, fire exits, better insulation, and other upgrades to make them more accessible for our older members. Nick Johnson recently posed the idea of a “dinner lodge,” a return to the older days when brothers met to discuss some bit of education, and enjoy some friendly association. Maybe the next few decades will see more large temples being sold off, but — hopefully — more active members meeting to enjoy fellowship, without worrying about fixing the potholes, repairing the roof, or wondering how they are going to pay for the upkeep on a mausoleum that only gets used once a week by a dozen guys. After all, is your lodge the building, or is it the members? Edit: I should have mentioned Connecticut’s own take on this: both Quinta Essentia Lodge No. 500, and Hospitality Lodge No. 128. Our family spent the weekend in New York City, just doing a little sight-seeing and soaking up the local color. Expecting rain and cold, we dressed like typical New Englanders, but were pleasantly surprised when the rain held off for most of Saturday. Having spent the afternoon wallowing in little souvenir shops in Chinatown, and late lunching at an open-air bistro in Little Italy, we spent the evening getting culture-fied at the Metropolitan Museum of Art, on the Upper East side of Central Park. When I was in my 20s, I used to take a lot of trips into New York City, and spent most of my time in the lower island browsing shops and bookstores, eating in odd restaurants, clubbing in SoHo and Greenwich Village. And once a year I’d get together with a few of my friends and we would tackle the Five Borough Bike Tour, a 25 to 30 mile route that started in Battery Park and finished in Staten Island. Once or twice, the cold, wet spring rains determined us to seek shelter from the rigors of the seasons; we might have dropped out early from the inclemencies of the weather to seekk solace in the local watering holes. But those are stories for other days. When you live in a small New England town (are there any other kind? ), you can easily be overwhelmed by the majesty of the architecture in a big city. We stayed in an area that had a mix of old brownstone mansions (converted into co-op housing) and new granite faced behemoths. Thirty years ago, I’d never given much thought to the decoration and ornament on those old buildings, but – as I imagine happens to every Mason – I now marvelled at the work and detail that went into the various columns on the buildings, old and new. Even more inspiring was the architecture of the outside of the older section of the Metropolitan Museum of Art. Okay, then how about a taste of the inside? We simply do not see things built to this kind of scale in our small ex-farming communities. In one of those synchronistic linkings, just a few weeks ago I rehearsed a section from a lecture pertaining to columns such as these, so I might have been just a little more attuned to noticing them in passing than I otherwise might have been. Coincidentally, by the time we got to the galleries, there was a rather nasty storm raging outside, so the opportunity to seek shelter from the inclemencies of the weather was not lost on us.I enjoyed the opportunity to point out little details to my daughter, after which we spent some time in the inevitable museum gift shop. As it happens, the Met has a wonderfull gallery filled with a number of similar items, plus several entire rooms devoted to the art and scuplture from that period. I know that most of my brethren think of visiting famous lodges when on a trip to NYC, but hopefully I’ve suggested a curious way to spend an afternoon before those lodges are in session. This past weekend we had a party for my parent’s 50th wedding anniversary. It turned into a family reunion as the hordes of out-of-town relatives descended on the small town of Woodbury, Connecticut and took over an inn for the weekend. I made a few notes on it elsewhere, so I don’t need to repeat it here. But I did want to mention that on Saturday morning, while some people were nursing hangovers and others were antique shopping or visiting the local flea market, I took the opportunity to get a little quiet time to myself. Having been on a fitness kick since early summer, I had brought my road bike with me, and took a nice spin up and down historic Rte 67 from Southbury up through the center of Woodbury and headed out toward Watertown. 67 and US 6 run together at these points, and people not familiar with New England may not realize that US 6 is an old pre-Revolutionary War highway. Frankly, after seeing how many famous “Founding Fathers” and other early patriots slept along the route, it’s a wonder that we managed to rouse the troops at all, let alone win our independence. That said, as I rode through Woodbury, just near the center of town I saw a huge 2-story high rock cliff with a rickety stairway bolted and supported along the side of the rock itself. A glance at the top of the stairway showed a plain white building with the familiar square and compasses. Without even seeing the sign I knew I was in front of the legendary King Solomon’s Lodge No. 7. 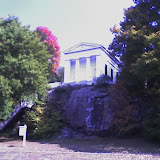 The “lodge with the stairs” as it’s sometimes called by people in the Northeast corner of the state, and while I’d passed by it dozens of times, that was before I was a Mason, and so never really noticed it. I’d heard stories about these stairs which are decidedly not to the local handicapped access building codes. In fact, a closer view of the stairway made me wonder how in the world a bunch of seventy-year old brothers could even manage this in the dark when I was hesitant to get close to them in broad daylight. The stairs are blocked off with boards and a Private – No Trespassing sign, but my guess is that the sight of thin boards and skinny metal pipes braced against the rocks would deter all but the most stout-hearted of interlopers. Not realizing that the foliage and other scenery would be so pleasant during my 20-odd mile ride through the area, I didn’t pack my regular digital camera. These pictures were only taken with my phone camera, which really doesn’t do justice to either the building or the beautiful autumn scenery along the road. But I’m glad that I managed to at least get a glimpse of Masonic history over the weekend. King Solomon No. 7 is one of the oldest lodge buildings in the state, and there is a fascinating history behind the stairway which can be read on their website here.